Software is useful to design different type of ID cards including - Student ID card, Employee ID card and ID badges, Staff ID card, name I-card and ID tag, Membership ID card and other similar type of Identity cards. Design and create ID card in Rectangle, Rounded Rectangle, Ellipse or CD/DVD label shape. Add message using message templates during ID card designing process. Specify the ID card Color and Gradient color during ID designing process. Option to add custom image or add image from the library during ID designing process. 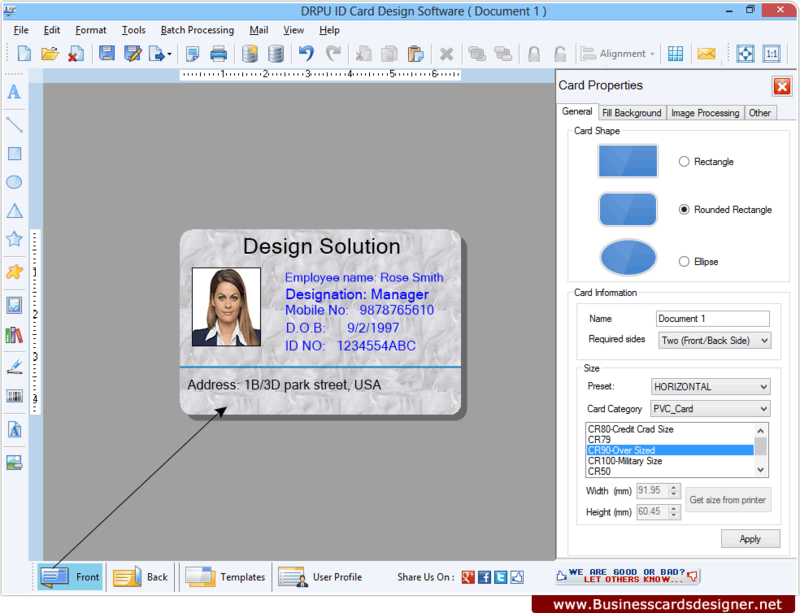 Design and create Identity cards using image designing tools including Line, Ellipse, Pencil, Rectangle, Text, Barcode, Picture, Arc, Triangle and Star objects. Create ID cards with specific type of fold including Quarter Fold, Half Fold in simplified way. Facility to print designed identification cards with advance print settings along with print preview facility. Add WordArt text-styling feature to the ID card to give the card text different looks. Provides option to start new ID card format or edit existing ID card format.